Police officers on Thursday stand outside the New York home of Craig Spencer, a Doctors Without Borders physician who tested positive for Ebola. A physician who had returned to New York City 10 days ago after treating Ebola patients in West Africa has tested positive for the disease, according to an official familiar with the findings. Craig Spencer, a 33-year-old physician who worked with Doctors Without Borders and lives in Upper Manhattan, is the fourth person to be diagnosed with the deadly disease in the U.S.
Dr. Spencer was diagnosed with the disease after treating patients in Guinea. 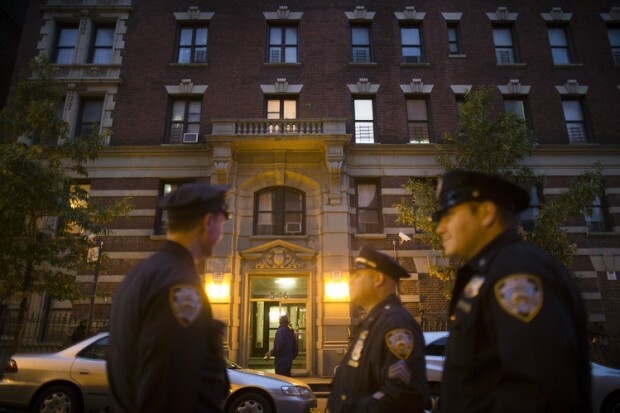 He reported a fever and gastrointestinal problems Thursday morning and had quarantined himself in his Upper Manhattan apartment. He was rushed to Bellevue Hospital Center in an exposure suit, where he was quarantined in a specially designed hospital room. Mayor Bill de Blasio and New York Gov. Andrew Cuomo scheduled a 9 p.m. news conference at Bellevue to discuss the case. City officials said detectives were tracing Dr. Spencer’s contacts to determine whether anyone else is at risk of becoming ill. His girlfriend also was being tested for the disease. City officials said Dr. Spencer was communicative and cooperative about his whereabouts and contacts. Dr. Spencer, a staff physician at New York-Presbyterian/Columbia University Medical Center, hadn’t been back to work since his return from Africa and hadn’t seen any patients, the hospital said. “He is a committed and responsible physician who always puts his patients first,” the hospital’s statement said. Dr. Spencer’s apartment has been sealed off, according to a law-enforcement official. City Health Department workers were outside the building Thursday afternoon, handing out Ebola information brochures and reassuring residents.